One of my coworkers took a few of us out on his boat for the afternoon. 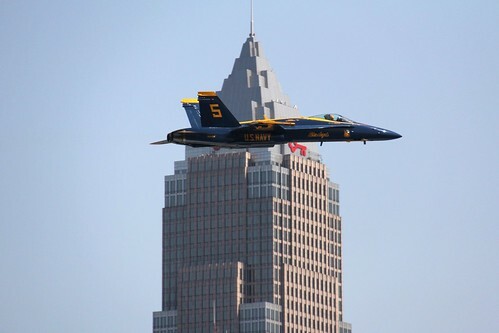 He launches out of the Whiskey Island Marina just outside of downtown Cleveland, so we had an ideal vantage for watching the Blue Angels practice for the Cleveland Air Show. Afterward, we went out onto the lake proper to make a trip around the Cleveland Crib before getting a closer look at the airstrip and then returning to port. I wasn't sure what results to expect out of my 18-200mm zoom, but I was thrilled to discover images like this one in my results. And it's clear to me now that I wouldn't have been able to get it all without having the extremes range that the 18-200 provides in a single lens. Heck, the whole set is actually pretty decent. On a meta milestone front, this photo puts me officially at the two-thirds point! I still have some catch-up to do, but I've stayed true to the "shoot every day" rule and am excited to have made so much progress.